Betty Lieder, Iowa polio survivor. Small localized paralytic polio epidemics began to appear in the United States around 1900. But it was not until 1952 that the United States polio epidemic became the worst outbreak in the nation’s history. Of nearly 58,000 cases reported that year 3,145 died and 21,269 were left with mild to disabling paralysis. Polio is a disease that can infect the central nervous system (brain and spinal cord) and cause lasting disabilities in a small number of infected individuals. It is caused by any of three types of polio viruses. Up to 95 percent of individuals with a polio infection have no symptoms. A small number (4 to 8 percent) have mild symptoms, such as a sore throat, headache, malaise, upset stomach and low-grade fever. These individuals generally recover completely within a week. About 1 to 2 percent of infected individuals develop a high fever, meningitis (inflammation of membranes surrounding the brain and spinal cord), stiff neck and limb pain. These individuals generally recover completely, usually within 10 days. In fewer than 1 of every 100 infected persons, the virus attacks nerves inside the spine that send messages to muscles in arms, legs and other areas. This can result in partial or complete paralysis. If the virus gets into the brainstem (bulbar polio), muscles needed for breathing, swallowing and other vital functions become paralyzed, and the person may die. 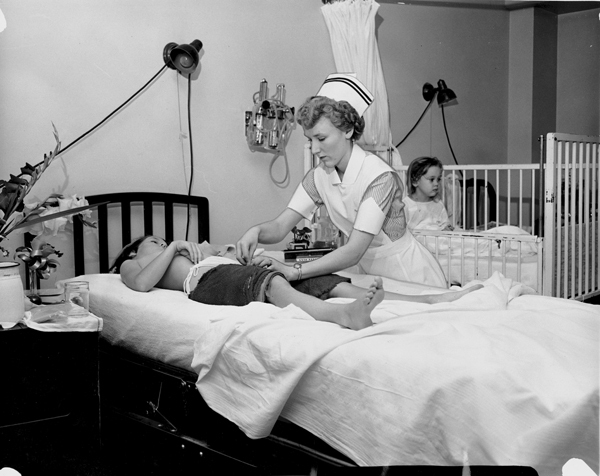 Nurse treating an Iowa polio patient. Polio was no stranger to Iowa. As early as 1910, records show 186 cases that year. Polio reoccurred every few years in Iowa. But in 1940 the number of cases skyrocketed to 927. The period 1948-1950 averaged 1,300 cases yearly. The disease peaked at more than 3,500 in 1952. A quarter of them were in Sioux City. After public health inspectors investigated 59 cases in Cerro Gordo County, the State Board of Health required that all cases be reported. And it recommended quarantine and sanitary measures be taken. A gamma globulin vaccine was tested on 16,500 children in Sioux City during the worst epidemic in Iowa. It was part of a national trial. But the vaccine gave only short-term protection. Iron lungs, large machines that enable a person to breathe, were flown to Sioux City to assist those whose breathing muscles were impaired. 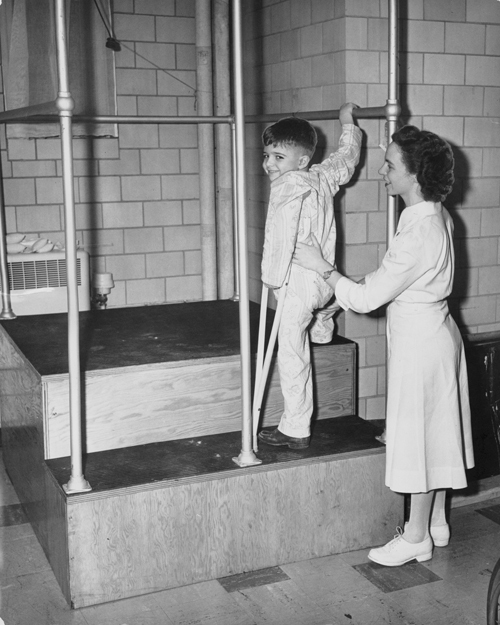 Child with polio recieves physical therapy. As the weather warmed up each year, panic over polio intensified. Polio swept through towns in epidemics every few years. Most often affecting children, few diseases frightened parents more than polio did. It was especially scary because health professionals were unsure how it was spread and the best ways to treat and prevent the virus. Research showed that by 1900, while most poor immigrant children had become infected and immune at an early age, children from clean, middle-class homes were at greater risk of the paralytic form of the disease. Polio virus attacks the nervous system and impairs muscles, sometimes causing temporary paralysis. Late summer was dubbed "polio season." Public swimming pools were shut down. Movie theaters urged patrons not to sit too close together to avoid spreading the disease. Insurance companies started selling polio insurance for newborns. Though most people recovered quickly from polio, some suffered temporary or permanent paralysis and even death. 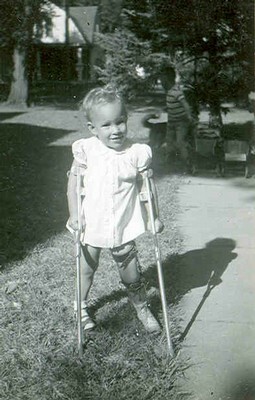 Many polio survivors were disabled for life. They were a visible, painful reminder to society of the enormous toll this disease took on young lives. Parents visiting their quarentined children at Blank Hospital, Des Moines, IA. Because polio is highly contagious, children, adolescents, and adults diagnosed with polio were usually quickly whisked away to the isolation wards of the nearest hospital accepting polio patients. Here, separated from the support of parents and family, these patients endured creeping paralysis as doctors and nurses stood by unable to do more than make them comfortable while the disease ran its course. Only when the acute infection waned could patients and doctors begin to assess how much paralysis had resulted from the damage done by the virus. The enforced separation of families during the early, acute phase of the disease contributed to the intense dread and fear that polio aroused. Children and parents were not allowed any contact for ten to fourteen days and then only limited visiting for weeks afterward. When the person returned home weeks or months later, adjustment to changed circumstances brought more stress. 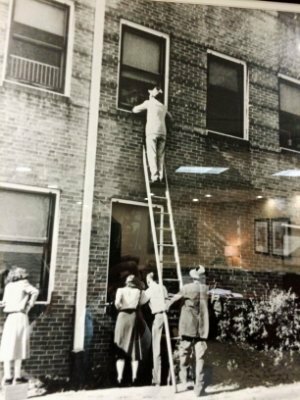 Even though the children were quarentined parents used creative ways to visit their children through the hospital windows. Parents could be seen gathered outside of a hospital window trying to make contact with their child while they were in the isolation ward.